Plastic Toy Ferguson P99 4wd Grand Prix car by Ingap Toys of Italy. Ferguson Grand Prix car by Ingap. Ferguson P99 Formula 1 toy car. Ingap toys made a name for itself prior to WW2 by producing a huge variety of tin-plate toys. 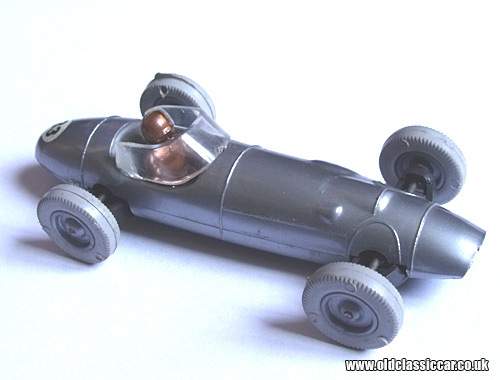 This classic 1/40 scale toy, based loosely on the four-wheel-drive Ferguson P99 Grand Prix car, would date to the early 1960s (probably 1963) and is made from lightweight plastic rather than tin. The legend on the base simply reads - in English note - "Ingap - Made in Italy - Ferguson F1". The P99 made its debut in 1961. Although 4wd in Formula 1 would be banned soon after, the car hit the headlines while in the hands of Stirling Moss by winning the Oulton Park Gold Cup in 1961. The car was also well positioned to win that year's Aintree race meeting too, although was black-flagged before the end of the race due to an infringement of the rules. Despite these promising signs, four-wheel-drive never did break through into the Grand Prix racing arena. The world of rallying however would, eventually, prove to be a comfortable home for the benefits of all-wheel-drive in motorsport. This toy measures 4 inches in length.